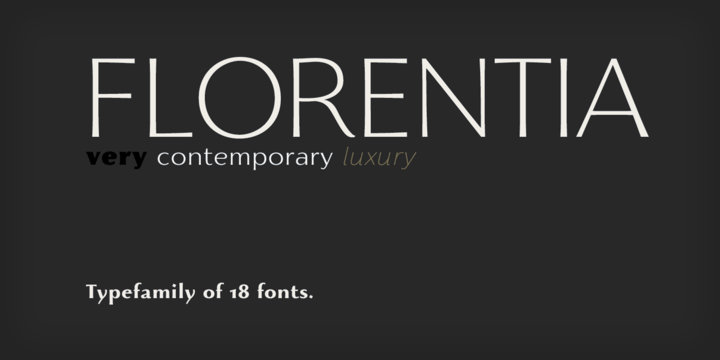 Florentia is a contemporary sans serif typeface created by Francesco Canovaro and published by Zetafonts. Inspired by Luxury and Renaissance Florence Lifestyle, it comes in 9 weights and true italics, an extended character set and multilingual support. With a humanistic touch it is suitable for display, editorial, headline, logo, magazine, poster, text, web and so on. Enjoy Florentia! Price: starting from $29 for one font, to $130 for all 18 fonts. A font description published on Thursday, July 27th, 2017 in Fonts, Francesco Canovaro, Zetafonts by Alexandra that has 2,480 views.